In the heart of a bustling Provençal village a beautifully decorated 17th century house with enclosed courtyard and swimming pool. REDUCTIONS FOR 4 PEOPLE! The property, with origins in the 17th century, has undergone a complete renovation. 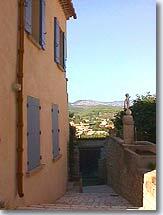 From the courtyards and pools, there are views over the countryside and up to Mont Ventoux. 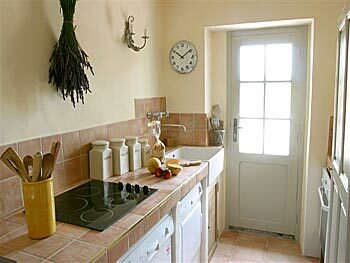 The house has been entirely decorated with great French and Provencal character. It features exposed stone walls, beautiful ceramic tile work, top quality appliances and fixtures, and a combination of stylish modern furniture and antique pieces. 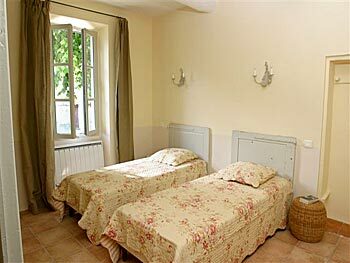 All bedrooms have twin beds and full en suite bathrooms. In the heart of a bustling Provençal village, this 17th century house has been decorated with great taste. The property grounds include an enclosed swimming pool. Beside the pool is a gravelled courtyard with oleander, lavender, rosemary, young cypress and olive trees and other flowering shrubs - adjacent to the house is a shaded stone terrace with dining table. The terrace faces north, which makes it the ideal location for leisurely outdoor meals. And you’re just steps from the plane-tree shaded main square and cafés, restaurants, bakeries, markets and all services you’ll need to settle into Provençal village life. The entry hall opens to a lovely living room with two beige sofas grouped around an ottoman-coffee table. A cane bench and chairs complete this appealing room with French door opening to the terrace and pool. 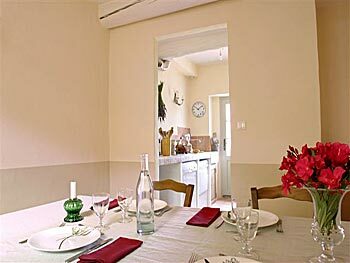 To the left is the dining area with French country table and chairs. Adjacent to the dining area is the galley kitchen. Well designed and fully equipped, it has terracotta tile counters, gray wood cabinets and a door opening to the covered dining terrace. Also on this level are separate toilet facilities. Stairs from the entry lead to three bedrooms, each with comfortable twin beds and full ensuite bath/shower rooms. On the second floor are two bedrooms with tiled showers. 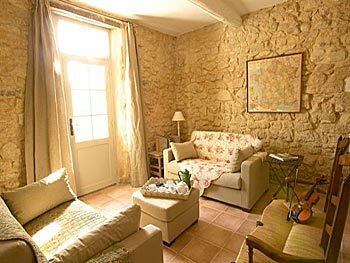 A spacious master suite occupies the entire third floor with windows onto the garden and views of Mont Ventoux. The bathroom includes a tiled tub with shower and double sinks. All the bedrooms feature lovely quilts, antique tables, lamps and closets. The bathrooms boast beautiful ceramic tilework with colorful painted tile accents over the sinks. The property is in the vilage of Caromb where you’re just steps from the plane-tree shaded main square and cafes, restaurants, bakeries, markets and all the services you’ll need, to settle into French Provençal village life.